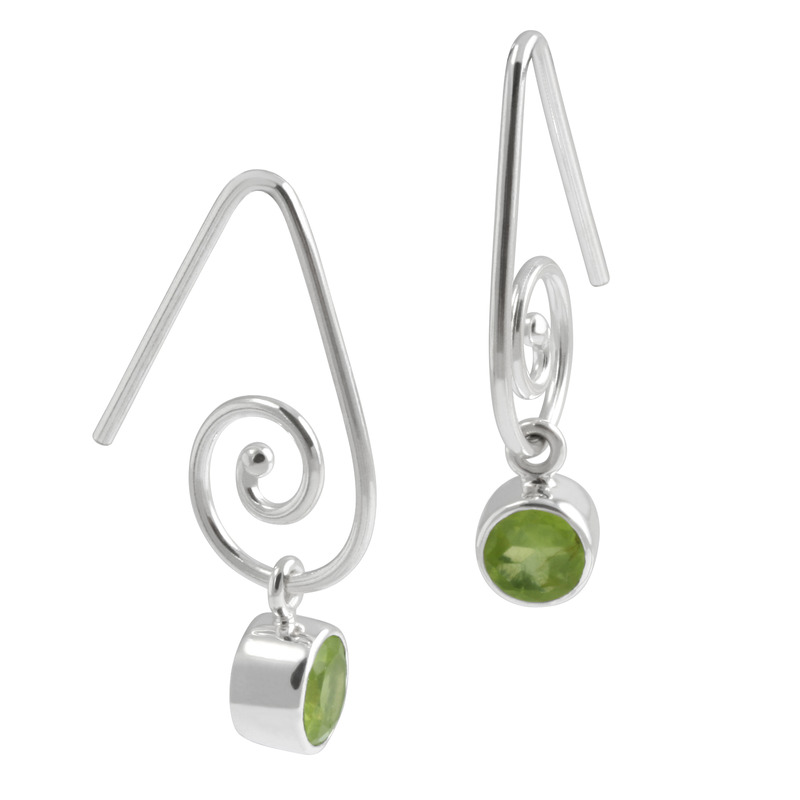 Introducing warm and friendly Peridot, a stone with a long history of interaction with humankind. Belonging to the Olivine family, this stone, which represents harmony and abundance, is found scattered throughout the Earth, and amongst the stars of our galaxy. Peridot’s relatively long history of contact with Humans began about 2500 years ago, when it was found on the island of Zabargad in the Red Sea. That island has been known by many names over the years, including Topazios, which is why to the ancient world, peridot was referred to as “topaz”, or “topazion”. But in the 18th Century the mineral we now know as topaz was officially named so, and so the green stone from Zabargad was renamed “peridot”, perhaps after the Arabic word for gem, “faridat”. The “correct” pronunciation of peridot is peri – “doe”, as in a female deer. Peridot belongs to the Olivine group of minerals. Olivine is a common mineral that is said to make up close to 50% of the Earth’s upper mantle. There are beaches in Hawaii where the sand is almost entirely composed of olivine granules. Not only common to Earth, olivine has also been found on the Moon and Mars, and even as granules embedded in the matrix of meteors (these are known as Pallasites). Recently, NASA scientists observed crystals of olivine raining down on a distant infant star. 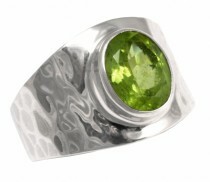 It is the more rare, transparent, gem quality olivine that is referred to as peridot. Olivine is in fact a mineral series, which forms in ultramafic (magnesium and iron rich) igneous rock. A “mineral series” occurs when two different elements can substitute for each other in the composition of a mineral, without affecting the mineral’s crystal structure. In the case of olivine, its composition can vary from pure iron silicate (Fe2SiO4) to pure magnesium silicate (Mg2SiO4), or more commonly, a mix of both magnesium and iron in varying amounts. This is known as magnesium iron silicate (Mg, Fe2SiO4). Where both magnesium and iron are present but iron is more prevalent, the mineral is referred to as fayalite. When magnesium is more prevalent, it is called forsterite. Generally peridot falls into the category of forsterite. 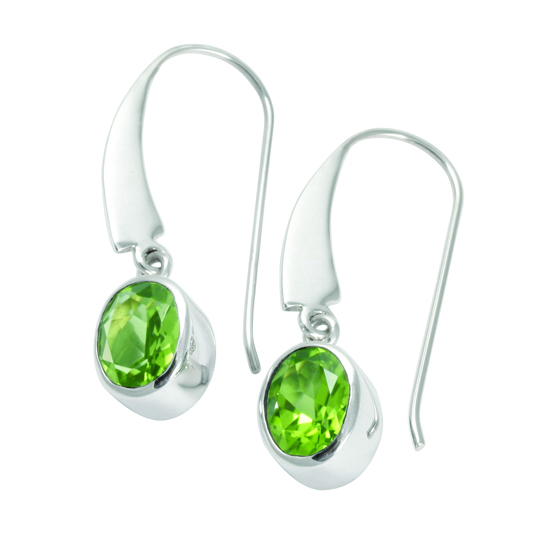 A composition of 12% to 15% iron with traces of nickel and chromium produce the finest colours of peridot. 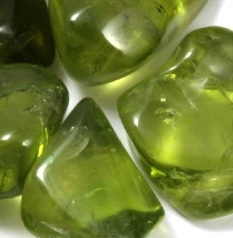 Peridot will crystallize at high temperatures when its host rock is still in molten form. Erupting volcanoes have been known to spurt solid granules of olivine mixed in with the molten lava. 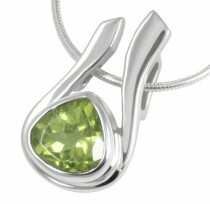 Peridot ranges in shades of green from olive to mint to an intense and warm golden green. It is occassionally also yellow to brown. Peridot is, of course, best known as a gemstone. But olivine has industrial uses as well. In its magnesium-rich form, it is used in refractory sand and brick because of its great resistance to heat. It may even have a role to play in combating climate change. Magnesium-rich olivine is being considered as a candidate for a process called Mineral Sequestration, whereby C02 reacts with olivine and water to remove the carbon from the atmosphere and trap it in harmless minerals, like serpentine, magnesite and silica. The breastplate worn by the Israelite high priest who served in the Holy Temple in Jerusalem featured 12 stones, and one of those stones, “Tarshish”, is believed to have been a peridot. Peridot’s energy is one of harmony, self-confidence and abundance. Everybody gets his or her fair share, but there’s a clear message here that we need to take responsibility for ourselves. It effectively prepares us to achieve what is already rightly ours. Stimulating the 3rd and 4th chakras, peridot it is said to help align ones heart with ones will. To put it another way, it can help one to manifest the heart’s desire – as long as one is already being true to oneself. It is considered to have a warm and friendly energy that radiates positivity and wellbeing, and can restore self-esteem, confidence and courage. It inspires a sense of self-contentedness. It helps us to be aware of the patterns in our lives that don’t serve us well, and empowers us to make amends and move forward. It is in becoming aware of the patterns that have limited us that we are able to make the adjustments necessary to begin manifesting the life we want. When we remove the barriers, the Universe responds. 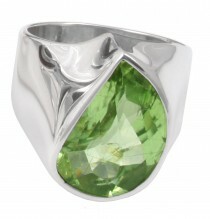 Peridot is attributed with creating a protective shield around the body, though it won’t protect one from oneself. Assuming one is already balanced and cleansed, peridot will afford protection from outer influences. Other qualities attributed to peridot include its ability to help us find things that we’ve lost. It is also said to help one to communicate with beings from the nature spirit realm. Physically, peridot is said to help in the healing of the heart, intestinal tract, lungs, spleen, and eyes. Some have even claimed that it will slow the aging process and stimulate contractions during the birthing process. Peridot relates to the astrological signs of Leo, Virgo, Libra, Scorpio and Sagittarius, and vibrates to the numbers 5, 6 and 7.